"Revolutionist" redirects here. For the Hemingway short story, see The Revolutionist. The term—both as a noun and adjective—is usually applied to the field of politics, and is occasionally used in the context of science, invention or art. In politics, a revolutionary is someone who supports abrupt, rapid, and drastic change, while a reformist is someone who supports more gradual and incremental change. A conservative is someone who generally opposes such changes. A reactionary is someone who wants things to go back to the way they were before the change has happened. According to the goals of the revolution they propose. Usually, these goals are part of a certain ideology. In theory, each ideology could generate its own brand of revolutionaries. 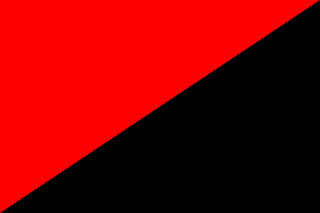 In practice, most political revolutionaries have been either anarchists, communists, or socialists. According to the methods they propose to use. 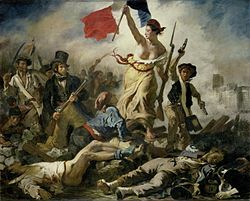 This divides revolutionaries in two broad groups: Those who advocate a violent revolution, and those who are pacifists. "The revolutionary is a doomed man. He has no private interests, no affairs, sentiments, ties, property nor even a name of his own. His entire being is devoured by one purpose, one thought, one passion - the revolution. Heart and soul, not merely by word but by deed, he has severed every link with the social order and with the entire civilized world; with the laws, good manners, conventions, and morality of that world. He is its merciless enemy and continues to inhabit it with only one purpose - to destroy it." According to Che Guevara: "At the risk of seeming ridiculous, let me say that the true revolutionary is guided by a great feeling of love. It is impossible to think of a true revolutionary lacking in this quality"
According to the Marxist Internet Archive a revolutionary "amplif[ies] the differences and conflicts caused by technological advances in society. Revolutionaries provoke differences and violently ram together contradictions within a society, overthrowing the government through the rising to power of the class they represent. After destructing the old order, revolutionaries help build a new government that adheres to the emerging social relationships that have been made possible by the advanced productive forces." Revolutionaries may be terrorists, but there is no necessary overlap. Russian revolutionary Vladimir Lenin considered terrorism to be "destroying contact between the revolutionaries and the masses of the revolutionary classes of the population, and spreading both among the revolutionaries themselves and the population in general utterly distorted ideas of the aims and methods of struggle against the autocracy." In his controversial essay "Our Morals: The Ethics of Revolution", the Marxist political theorist Norman Geras posited that terrorism should be rejected, but that violence could be justified in the case of extreme social injustice. ^ Sergey Nechayev (1869). The Revolutionary Catechism Archived 2017-02-06 at the Wayback Machine. ^ Guevara, Che. "Socialism and man in Cuba". www.marxists.org. Archived from the original on 10 August 2017. Retrieved 6 May 2018. ^ Geras, Norman (1989). "Our Morals: The Ethics of Revolution". Socialist Register. Retrieved 16 November 2018. ^ Eleni Courea (11 November 2018). "University alerts students to danger of leftwing essay". The Observer. Retrieved 16 November 2018. Libertarian socialism is a group of anti-authoritarian political philosophies inside the socialist movement that rejects the conception of socialism as centralized state ownership and control of the economy. Libertarian socialism is close to and overlaps with left-libertarianism and criticizes wage labour relationships within the workplace, instead emphasizing workers' self-management of the workplace and decentralized structures of political organization. Economic determinism is a socioeconomic theory that economic relationships are the foundation upon which all other societal and political arrangements in society are based. The theory stresses that societies are divided into competing economic classes whose relative political power is determined by the nature of the economic system. In the version associated with Karl Marx, the emphasis is on the proletariat who are considered to be locked in a class struggle with the capitalist class, which will eventually end with the revolutionary overthrow of the capitalist system and the gradual development of socialism. 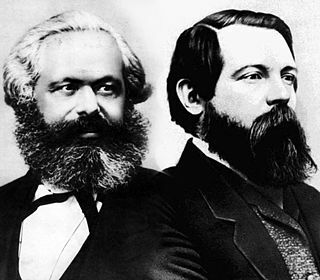 Marxist thinkers have dismissed plain and unilateral economic determinism as a form of "vulgar Marxism", or "economism", nowhere included in Marx's works. Appearances of Argentine Marxist revolutionary Che Guevara (1928–1967) in popular culture are common throughout the world. Although during his lifetime he was a highly politicized and controversial figure, in death his stylized image has been transformed into a worldwide emblem for an array of causes, representing a complex mesh of sometimes conflicting narratives. Che Guevara's image is viewed as everything from an inspirational icon of revolution, to a retro and vintage logo. 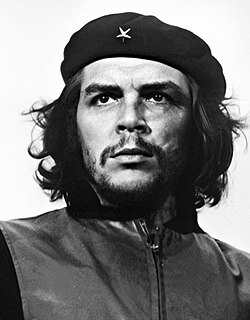 Most commonly he is represented by a facial caricature originally by Irish artist Jim Fitzpatrick and based on Alberto Korda's famous 1960 photograph titled Guerrillero Heroico. The evocative simulacra abbreviation of the photographic portrait allowed for easy reproduction and instant recognizability across various uses. For many around the world, Che has become a generic symbol of the underdog, the idealist, the iconoclast, or the martyr. He has become, as author Michael Casey notes in Che's Afterlife: The Legacy of an Image, "the quintessential postmodern icon signifying anything to anyone and everything to everyone." The legacy of Argentine Marxist revolutionary Che Guevara is constantly evolving in the collective imagination. As a ubiquitous symbol of counterculture worldwide, Guevara is one of the most recognizable and influential revolutionary figures of the twentieth century. However, during his life, and even more since his death, Che has elicited controversy and wildly divergent opinions as to who he was and what he represented. Mostly revered and occasionally reviled, he is passionately characterized along the entire continuum as everything from a heroic defender of the poor, to a cold-hearted executioner. Admired, sanctified, romanticized and derided, his crystallized status as either a brilliant intellectual or a violent ideologue is usually dependent on where one falls along the left and right of the political spectrum. The debate around his legacy is further complicated by the fact that Guevara exists simultaneously as several different entities, both literal man and global emblem, leading to disputes between what people contend he did and what he now represents. 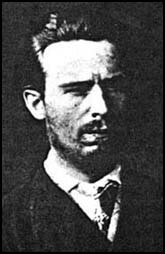 The Catechism of a Revolutionary refers to a manifesto written by Russian revolutionary Sergey Nechayev between April and August 1869. Guerrillero Heroico is an iconic photograph of Marxist revolutionary Che Guevara taken by Alberto Korda. It was captured on March 5, 1960, in Havana, Cuba, at a memorial service for victims of the La Coubre explosion. By the end of the 1960s, the image, in conjunction with Guevara's subsequent actions and eventual execution, helped solidify the charismatic and controversial leader as a cultural icon. Korda has said that at the moment he shot the picture, he was drawn to Guevara's facial expression, which showed "absolute implacability" as well as anger and pain. Years later, Korda would say that the photograph showed Che's firm and stoic character. Guevara was 31 years old at the time the photograph was taken. 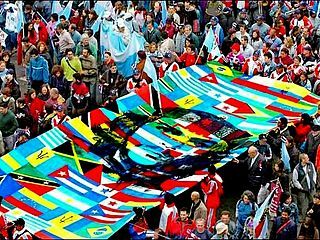 The Workers' Socialist Movement is a Puerto Rican democratic socialist revolutionary organization, formed in 1982 and dedicated to the self-organization and self-emancipation of the working-class in Puerto Rico, as well as international solidarity with the workers struggles worldwide. It is usually known as the "MST", and its youth section is the Unión de Juventudes Socialistas, also known as the "UJS-MST" or simply "UJS". The MST supports a socialist and independent Puerto Rico. Fidel Castro proclaimed himself to be "a socialist, a Marxist, and a Leninist". As a Marxist and Leninist, Castro believed strongly in converting Cuba and the wider world from a capitalist system in which individuals own the means of production into a socialist system in which the means of production are owned by the workers. In the former, there is a class divide between the wealthy classes who control the means of production and the poorer working classes who labor on them, whilst in the latter, there is a decreasing class divide as the government redistributes the means of production leading to communism.